Thick pink emulsion, easy to use, leaves a lasting pine freshness. Ideal for sick rooms and nursing homes, cleans, deodorises and freshens floor coverings and furnishings soiled by incontinent patients. ,Will not affect paintwork, floors or fabrics. •Suitable for use in animal dispensaries and wherever clean sanitary conditions are required. •Effective against MRSA. Floors, walls, drains, toilets, sick rooms, nursing homes, schools, hospitals and factories. Also suitable for cleaning and deodorising of all animal housing and veterinary premises. 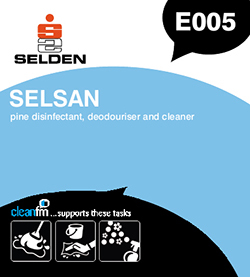 For cleaning, dilute 'Selsan' 1 part to 60 parts warm water. Use more concentrated as required to remove stubborn grease and stains.